Another second-half collapse but this time we rescued it. I suppose you could say we won a “crunch” or tight game but it didn’t really feel like that and should never have been that. Poor quality fare from both teams, Kildare really only played well for a few minutes before the interval. Tipperary were poor standard too. Division Two is a world away from Division One. Would be nice to think we can escape it next week but hard to see us recording our first win in Donegal in 25 years on current form. Mark Donnellan 6 – another sound outing from the Maynooth custodian. Hard to blame him for either goal, indeed the first one was preceded by an excellent save. Mark Hyland 6 – prominent enough in the first-half, confident in possession. Sound rather than spectacular. Mick O’Grady 7 – excellent job on Quinlivan although the Tipp man was clearly rusty. Having a good season. 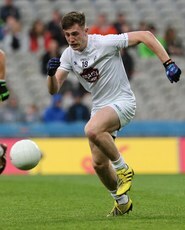 David Hyland 7 – collectively Kildare defended stoutly for most of the game despite the late aberrations and Hyland was on his game. * Cian O’Donoghue 7 (and a bit) -power and athleticism putting him in with a strong chance of a starting championship spot. Gets caught in possession a bit too often for our liking however. Edges man of the match for us. Eoin Doyle 7 – made plenty of interceptions. Still don’t like to see him wandering upfield as much as he does. No need for it when we’re nine points ahead. Peter Kelly 7 – did a good job on Sweeney and set up Conway’s goal with perceptive fist pass. Kevin Feely 7 – had hands full with two huge Tipp midfielders and I can only recall one mark although it came when we were wavering and needed it. Two brilliant points from play. Tommy Moolick 6 – trademark point and more involved than against Meath. Good to see him last two full games in a row. Will help him. Fergal Conway 7 – more like his best and took goal brilliantly, his first in the colours. Missed three chances though and gave away a few frees so not perfect by any means. Chris Healy 7 – decent first game back. Buzzed around and got on a lot of loose ball without really linking in with the full forward line enough. Excellent score from the wing and involved in Conway’s goal. Good to have him back. Cut the hair though, lad. Keith Cribbin 5 – not in the best of form at present. Ran into trouble far too often. Get sense he is only keeping the jersey warm for his brother, although clearly a favourite of Cian. Neil Flynn 7 – not a perfect game by any means, his mark missed from 13m could have proven disastrous. Then of course he scores from a ’45 against the wind to effectively clinch the match. Great score from the stand side as well in the second-half. Paddy Brophy 5 – looking so far off the pace these days it’s not funny. Even playing closer to goal he was was no danger to Tipperary and nothing went right for him. How did he lose so much pace in Australia under a professional regime? Maybe he came back to gaelic football too soon after coming back? Struggling to justify his inclusion at the moment. Jimmy Hyland 6 – another tough game for him. Well marked. Got one good point but skied his other effort when we could have done with a point. Different ball game this senior business but he’ll come good I think. Adam Tyrrell 7 – Not many players would have had the balls to go for that winning point. Fair play to him and great execution. Kevin Flynn 6 – came on at centre-forward and had a few possessions but missed a sitter. Good to have him back available though. Fionn Dowling – 6 – very little involvement. One effort deflected for a ’45 which was crucial and another effort wide.